Attendees listen to Miami students explaining their research projects. In an effort to attract more science-oriented prospective students from around the country, the College of Arts and Science (CAS) held its annual Discover the Sciences event, on Saturday, September 22. 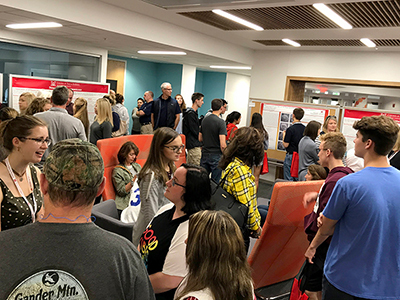 Well over 300 prospective students and their families packed into Benton and Pearson Halls to get an inside look into their desired science departments by observing laboratories and research posters and meeting with professors and students. "I've had a part in this event every year since it started," said Carol Richmond, senior associate director of admissions. "To see it come to this many people early in September, before they even apply, is amazing." Discover the Sciences was created by CAS faculty members, including dean and professor of chemistry Chris Makaroff, to provide high school students with an interest in mathematics or science a chance to explore all of the opportunities and resources that Miami would provide. Miami faculty field questions, from students and their parents, regarding their programs. Makaroff began the day by introducing a crowded Benton Hall auditorium to each of the 12 participating department chairs and directors and explaining why he has been at Miami for 30 years. "I was looking for a school where I could do cutting-edge research," said Makaroff. "That's how I got into biochemistry. But I also wanted a place that had a really strong focus in undergraduate research. At Miami I found both." After this introduction, Richmond presented application and admission information. Keeping in tandem with Makaroff's statement, she emphasized to the crowd Miami's ranking #3 for undergraduate teaching nationwide, according to the 2019 U.S. News & World Report. In order to give the visiting students a better understanding of life in Oxford, the program assembled a "Life at Miami" panel made up of 5 professors and 4 students from various science departments who addressed various questions. Callie Miller, a junior chemistry major and 2017-2018 Beckman Scholar, told the audience that "one of the main reasons I came to Miami was for the undergraduate research opportunities." "To me, it's the mixture of being able to teach freshman general chemistry in the morning and then go upstairs and getting to interact with some amazing undergraduate research students," said chemistry professor and department chair Michael Crowder. Students and parents interact with Miami undergraduate researchers. Following the panel, students and their guests were escorted to the recently renovated Pearson Hall atrium. 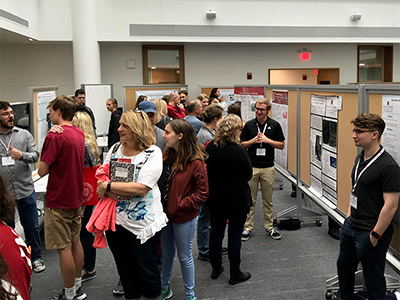 Twenty-nine undergraduate student researchers representing 11 science disciplines presented their posters for prospective students to observe and ask them questions. Faculty were also available during this time, and afterwards they led a number of lab and building tours and breakout sessions around campus to show off their science facilities. 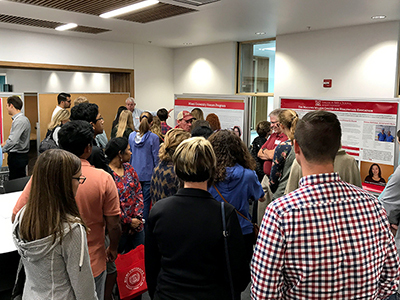 "Discover the Sciences gives these students a chance to see interesting research that they can be a part of someday," said Kristen Schuh, a junior psychology major who presented her poster alongside her faculty advisor, assistant professor of psychology Anna Radke. "While many schools focus more on their graduate students, Miami gives their undergraduates many opportunities to learn and grow through research." When the Discover the Sciences program first begun, it only included three departments. Today, 12 CAS departments and centers, ranging from anthropology and biology to environmental science and statistics, are included in the event. "Our program's model to connect prospective students with the faculty and current students has really made a difference over the years," said Richmond. "Our feedback and surveys remark about the strong faculty connection the guests already sense on just a day visit.